In the Cancerverse, the base of the Machine Resistance is under attack by the Revengers. While the intense battle rages on, Mantis tells Thanos to take himself away from the dangerous situation. Thanos refuses. Meanwhile, Cosmo attempts to telekinetically hold the Cancerverse Vision's broken body together. Suddenly, the android's wife, the Scarlet Witch, arrives. As the Guardians of the Galaxy expect her to attack, the Revengers' leader turns and launches a full-powered attack on her own team! The Scarlet Witch reveals that she has been working for the resistance since the beginning of the Many-Angled One's rule of the Cancerverse. Wanda decided to reveal her true allegiance once the Guardians arrived with Thanos. She believes he is their best chance of defeating Lord Mar-Vell. Thanos informs the Scarlet Witch that he needs to reach the site where the Necropsy Ritual was performed. She replies she can transport them to the location but it will exhaust her powers. Starlord apologizes for the suffering she will receive when Mar-Vell arrives but that it her abilities can help them stop the threat. Wanda understands and teleports the group. Elsewhere in the normal universe, an energy sphere resembling a number of Captain America shields emerges from the explosion of the starship Sanctuary! The shield fade to reveal Nova, Namorita, Quasar, Ronan, Silver Surfer, Gladiator, Beta-Ray Bill and Major Victory! Despite the loss of life in the explosion caused by Lord Mar-Vell, Beta-Ray Bill points out they now know of their foe's search for the avatar of death in their universe. Richard Rider is still surprised that the avatar is Thanos. He instructs the WorldMind to begin calculations for a Star-Gate to the Fault. At the Front, Medusa explains the current situation to the heroes who have just arrived through the Star-Gate. She tells them that the Kree, Shi'Ar, Spartoi and Blastaar's forces have been decimated. As a result, the Cancerverse's forces have been able to expand their reach across two parsecs of space. The leader of the Kree also points out the threat posed by the Galactus Engine. She states that the massively powerful weapon is barely being held back by their universe's Galactus and the Abstracts. Even worse, they have detected even larger and more powerful entities are preparing to enter our universe! Gladiator believes they should regroup their troops and call in all other races in one final rally. Nova argues that the best course is to join Starlord and the Guardians to assist them in their efforts to use Thanos to end the war. Medusa and Blastaar disagree with Rich and side with Gladiator's plan. The human rocket decides to go after Peter Quill and his group on his own and walks off. Quasar catches up with his friend and offers to fight by his side. Nova declines his offer and admits that Medusa was right that their power is needed on the battle front. Rich turns and suddenly gives Wendell a portion of the Nova Force to help him in the upcoming fight. The two friends say goodbye and wish each other the best. 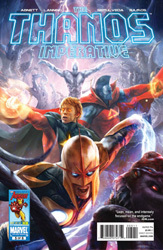 Meanwhile, Starlord, the Guardians and Thanos arrive at the Cancerverse's Necropsy Rite. Mantis senses the structures neither alive or dead but do contain ancient intelligences. Thanos reveals the super-dimensional coils of the Elder Gods transect at their location. He also states that all universes are converging there and it's the spot where Lord Mar-Vell let the Many-Angled Ones in to kill Death. Thanos informs the group he will need a few moments to figure out the magic used in the ritual. He points out that they can return to their universe since he can finish his work alone. The Guardians decline his offer and decide to stay. Suddenly, they find themselves facing Lord Mar-Vell and his Revengers! The Scarlet Witch had revealed their location before her soul was devoured. Thanos and Mar-Vell race towards each other with full fury! Back on Knowhere, Nova, Major Victory and Namorita examine the control center's computers for any clue to the location of the Guardians. The system recognizes Richard Rider's voice pattern and begins a pre-recorded message from Starlord. Peter confirms the resurrection of Thanos and that he's the only chance they have of stopping the Cancerverse invasion. He also informs Nova that the Guardians had been using Knowhere's Continuum Cortex to map the Fault long before the war. Rich can use the map to get into the Cancerverse and lock onto Starlord's Passport Transponder to locate them. As the message ends, Nova prepares for his trip through the cortex. Namorita insists on going with him but Rich refuses to let her go. He points out that they have no idea what going through the Fault will do to her due to her being recreated in it. His girlfriend isn't fooled and knows he's making an excuse to keep her safe. Standing alone on the platform, Nova instructs Major Victory to activate the Continuum Cortex! Back at the Necropsy Rite, Thanos and Lord Mar-Vell are fighting without hesitation while the Guardians battle the Revengers. The mad Titan continues to punch the ruler of the Cancerverse mercilessly into the ground! Suddenly, Thanos reveals that he doesn't want to win the battle but wants Lord Mar-Vell to grant him death. In return, Thanos offers to give Mar-Vell everything he wants including his complete loyalty!